When Lucy Lyons took a quick snap on her mobile phone of something rarely seen, two beautiful feather plumed horses and a carriage accompanied by two long coated, top hat wearing gents, she never imagined the impact loading it on social media would have. The tradition of horse drawn hearses continues in east London but is still an uncommon and rather magnificent sight. Is it any surprise that at a time when we post photos of our coffee to Instagram and kids take selfies at funerals, that Lucy posted a photo of beautiful horses pulling a hearse? Dr Lucy Lyons is a lecturer in drawing research and painting at City & Guilds of London Art School. As artist in residence at Barts Pathology Museum QMUL she coordinates a Share Academy project in partnership between UCL, UAL and London Museums Group investigating the role of drawing as a tool for working with foetal and neonatal specimens. She also teaches visual note taking for surgeons at Imperial College, Drawing 4 Surgeons, drawing pathology at St George’s medical school and Exploring art and medicine at Mary Ward Centre. She has exhibited in London, Greece, Lisbon and Copenhagen and is currently exhibiting work in a group show Ce Qui Fait Fragilité, at Galerie Vivoequidem in Paris. She will be in a group show Anatomic, at the Dalhousie Gallery, Halifax, Canada opening at the end of January 2015. For the last fourteen years I have researched and made work in dissection rooms, labs and medical museums often surrounded by the remains of those who suffered from disease, illness and injury. From researching the use of drawing to reveal experiences of Fibrodysplasia Ossificans Progressiva a rare disorder where connective tissue turns to bone, to research investigating the breadth of experiences of ageing in a medical context, I have spent a great deal of time working with examples of the broken, hidden, fragmented body and the processes used to preserve and conserve specimens. My current research as artist in residence at Barts Pathology Museum involves running workshops to find ways to overcome issues with foetal and neonatal specimens and encourage greater use and appreciation of these important objects through artistic encounters. I have been fortunate to have access to these wonderful and fascinating objects and always find myself drawn to document unique encounters. So it was not surprising when I recently went for my first ever eye test at an optician in my local area of east London, my attention was drawn to an event going on across the road. Just before I went in to my appointment I saw something I had rarely seen, two beautiful feather plumed horses and a carriage accompanied by two long coated, top hat wearing gents. 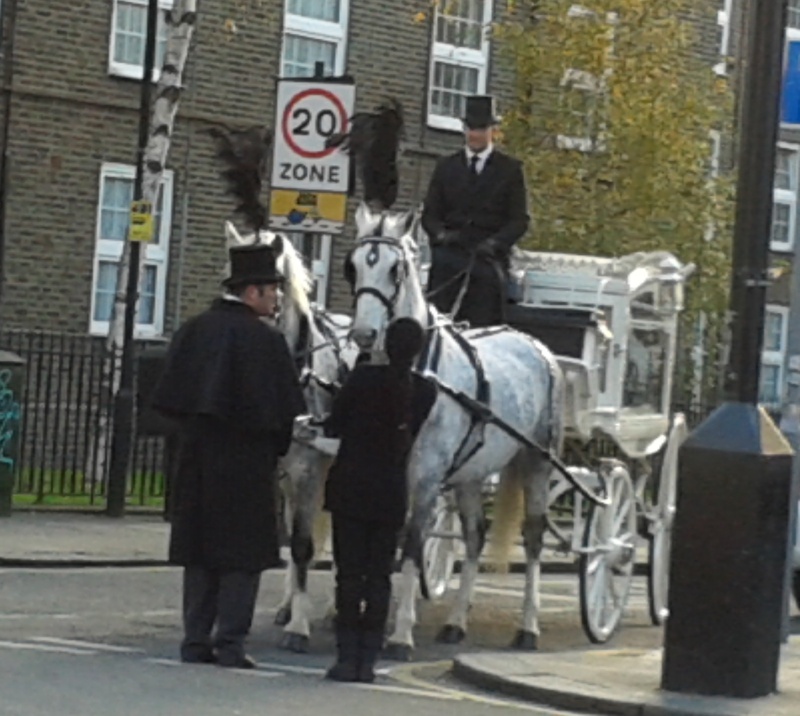 The tradition of horse drawn hearses continues in east London but is still an uncommon and rather magnificent sight. I did not have a camera but took a rather rushed and poor quality photo using my phone. This image seemed to me to encapsulate something about the neighbourhood, about traditions, community and history. It also seemed to say something about how death is sometimes something shared. I posted the photo here. I was surprised by the reactions that followed. Then someone commented “Isn’t it a bit inappropriate to take photos of someone’s funeral and post them on a public page? Think how their relatives would feel about that.” It was in fact a fair comment. Everyone has their own opinion on death and the issue of funerals and etiquette. It made me think. And what I thought was one can’t fail to be impressed as this carriage goes by. It is a public spectacle, one that stops traffic and where passers by are expected to stop and look. It is a public display of pride and love for the deceased and those who arranged the funeral obviously wanted to give their deceased loved one a good and well deserved send off. It is made to be eye-catching. Victorian horse drawn funeral hearses had become popular in Mid 1800s. When Prince Albert died in 1861, grief stricken Queen Victoria set the precedent for large-scale ostentatious funerals. Her influence was great and it became commonplace for families to save up large amounts of money which would be set aside for future funerals and the number of plumes afforded for horses demonstrated how much had been pent on the event. Horses could be white or black but white horses used to be for unmarried women and children and black only for men. Hiring a horse drawn hearse and beautiful horses is not a cheap option. Levertons, one of the oldest funeral services quotes £1000 for 2 horses, £1500 for four and that’s not including the coffin or supplement for hiring during weekends. I didn’t reply to the comment but waited to see if anyone else would write on the thread. I decided if any one else wrote they too felt it was inappropriate I would remove the photo, but I did not want to get into an argument with anyone over the issue. The discussion on the thread did continue. Someone wrote they would have been honoured if someone had posted a photo if it was their relative’s funeral but pointed out photographing during an actual service would have been different. This made me wonder about the fluidity of public and private of funerals. If a body is carried in one form or another on a public highway to a place for burial or cremation, it is by default public. And if the manner in which the body of the deceased is moved is as ostentatious as placing it in a glass carriage being pulled by horses with plumes, it is hardly a private matter. It is a public tribute and about status. As it was the same person I thought I would again wait it out. The discussion continued and people wrote on the post they would be honoured, proud or flattered for someone to take photos if it was their relative’s cortège. I decided to make a general comment, not one aimed at the critic and stated I did not intend to offend anyone and the carriage was empty but I had wanted to share an image of an east end tradition. I waited to see what would happen next. What followed were people agreeing they were not offended and sharing memories of other traditional funerals they had seen or remembered as well as recounting ones held for members of their own families. I felt exonerated. I had not been wrong. Synonymous with Cockneys, this traditional funeral is fairly rare now and the pomp and grandeur of this spectacle is worthy of snapping and sharing. However the next comment did take me by surprise as someone revealed, “That was my mother’s funeral.” I prepared myself for howls of indignation. I replied to her saying I was sorry for her loss and that I had just wanted to post it as it was such a wonderful image but offered to remove it immediately if it caused offense. I was amazed and wrote back thanking her for what I took as her permission and again offering my sympathies. It was at this point the author, who had taken great offence to the photo burst in again. As well as quite correctly criticising the image for being of very poor quality, I only had my phone on me so the picture is grainy and blurry, her anger spilled over into name calling towards everyone in the group. “Doesn’t matter” referred to the woman who had explained the funeral was her mother’s. Even though she was fine with the image being posted – the author who was upset did not think this justified it in anyway. “Funerals are private.” Actually only a service can be private by request. When on the public highway, going through public streets a funeral cortège is not private. But her main point I believe is the last. They are “not for social media.” Behind her rudeness she raised a very interesting point. He makes a valid point. One person replying on my post on Facebook pointed out that, “We may do things slightly different in New Zealand. I have my dads whole service and photos taken of the funeral, which is great for us as you can’t remember all that happens on the day.” I was also reminded of the Victorian tradition of not only photographing the dead as a way to remember them, but often whole families posed with the corpses of their dead relatives. Whether photographed as deceased family members or preserved and displayed in medical museums, this whole experience once again raises questions surrounding death, the body, privacy and what is deemed acceptable. Can death ever be wholly private and should it be? Should human remains be on display in family photos or in museums? Death is kept at a distance from the living and is culturally unfamiliar. It is most commonly seen in the form of news items, a film or an online game. Mediated through the computer or TV screen, the line between fact and fiction is blurred. When we encounter it in reality we are not equipped as in previous generations and do not have the experience to engage with the encounter. Yet we all become ill at some point, we all have known someone who has been injured or had surgery, we all know someone who has died. Perhaps if it were less unfamiliar to us it would be less shocking. And is it any surprise that at a time when we post photos of our coffee to Instagram and kids take selfies at funerals, that I posted a photo of beautiful horses pulling a hearse?